Zoleka Mandela (born 1980) is a South African writer, activist, and Nelson Mandela's granddaughter. She has written about her addictions, her daughter's death, and her own battles with breast cancer. Mandela was born in 1980 and is the daughter of Zindzi Mandela. Her mother's family, the Mandelas, are direct descendants of King Madiba of the Thembu people and serve as chieftains of Mvezo, their ancestral chiefdom. 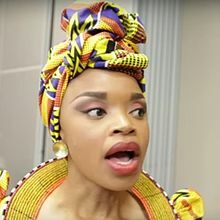 Zoleka has spoken about sexual abuse in her childhood. She was also addicted to drugs and alcohol for a time. In 2010, Mandela's 13-year-old daughter was killed in a car crash on the way home from a concert. The accident was said to be due to drugs and, at the time, Mandela was recovering from a suicide attempt. Mandela published her autobiography in 2013. Mandela was treated for breast cancer in 2011, which returned in 2016. She has used social media to describe the removed tumour and the side effects of her chemotherapy treatment. In 2016, she was chosen as one of the BBC's "100 Women". She noted that her big regret was that she felt that she has only done worthwhile things since her grandfather's death. She campaigned against deaths caused by road accidents noting the particular hazards affecting sub Saharan African children who are twice as likely to be killed in car accidents as children anywhere else in the world. ^ Llewellyn Smith, Julia (15 December 2013). "Zinzi Mandela - The Father I Knew". Telegraph. Retrieved 24 November 2016. ^ a b c "Zoleka Mandela Remembers her Daughter in Touching Tribute". TimesLive. 13 June 2016. Retrieved 24 November 2016. ^ a b Lang, Justine (2 December 2016). "100 Women 2016: Zoleka Mandela, survivor and granddaughter". BBC News. Retrieved 3 December 2016. ^ "Mandela's granddaughter Instagrams fight against breast cancer". Metro. 19 August 2016. Retrieved 24 November 2016. ^ "BBC 100 Women 2016: Who is on the list?". BBC. 21 November 2016. Retrieved 24 November 2016. ^ Mohn, Tanya (30 September 2016). "Zoleka Mandela Speaks Out: Africa's "Hidden Epidemic" Of Road Crashes Kills & Injures Schoolchildren". Forbes. Retrieved 24 November 2016. This page was last edited on 3 February 2019, at 10:39 (UTC).